Aylesford School wishes to work closely with parents and stakeholders to maximise attendance to school. There is a clear link between academic success and attendance and as such students should be aiming for 100% attendance each year. We have a designated Attendance officer who oversees attendance and monitors all student absence. We also work in close partnership with the local authority and outside agencies to support any students having difficulty attending school. We expect all students to attend school every day and arrive on time. We do understand that there may be a time when keeping your son/daughter off school is a necessity due to illness or other unavoidable circumstances. In such an event, please ensure you inform the school at the earliest possible time by calling the school on 01622 717341 and press 1 for attendance. Holidays during term time will not be authorised unless under exceptional circumstances with permission from the Headteacher. We strongly recommend that you do not book time away during term time as this will lead to a penalty notice being issued. The government has very clear expectations of student attendance and any student failing to meet the minimum expectation of 95% will be subject to monitoring and intervention by the school or local authority involvement. Our aim is to establish the highest possible standards of behaviour at Aylesford School. This is important so that the school is always a warm, caring, friendly and happy place where learning can flourish. Students’ behaviour around the school should be excellent; every lesson should be characterised by a relentless focus on learning, free from distractions. Every student and every member of staff should be able to feel relaxed and happy, confident that their working environment is one where people are kind, courteous and respectful at all times. 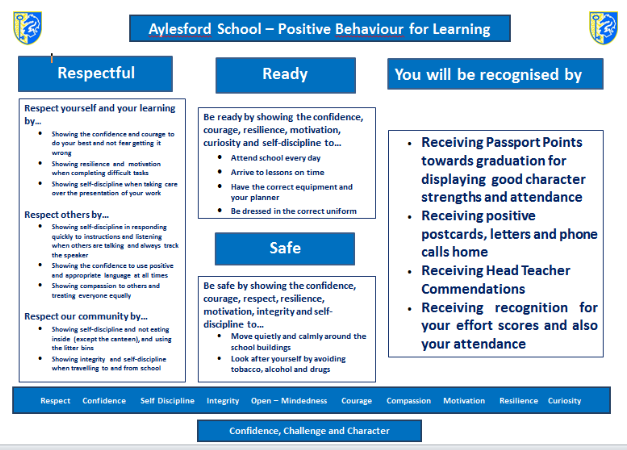 At Aylesford School behaviour for learning and rewards are recorded, tracked and monitored through Behaviour Watch. Our approach to positive behaviour should be applied with fairness and consistency at all times. Students should be challenged on any disregard for our expectations both in and outside of the classroom. All sanctions and incidents must be logged on Behaviour Watch. The schools expectations clearly focus on the positive behaviours that we want our students to display. These centre on three clear school rules that are easy for staff and students to understand. By ‘being ready’, we expect all students to wear the correct school uniform; have the correct equipment; complete their homework and be on time to school and lessons. By ‘being respectful’, we expect all students to be polite to everyone, be that in school, in our local area and whilst travelling to and from school. ‘Being respectful’ encompasses the positive traits we expect from our students, for example respecting the school environment by not littering. By ‘being safe’, we expect all students to behave in a way that keeps them safe and keeps other safe. We recognise that students have the right to feel safe. Our focus is to reward positive behaviour and to foster an atmosphere of respect at all times. We will recognise and reward students when they display our Character Strengths and other positive behaviours such as regular attendance, commitment to the school, representing the school, positive attitudes and effort towards learning and progress made. Students will gather Character Rewards throughout the year and these, combined with attendance and academic progress will allow students to attend a graduation event at the end of the school year. At Aylesford School we do not believe that a punitive sanction system of detentions has any positive impact on student behaviour or builds towards a positive culture of behaviour. Teachers should feel empowered to use the tools they have at their disposal to lead behaviour in their classroom, and when student’s expectations fall below what is expected, deal with this in a way that helps students make better choices in the future. Repair and Rebuild: The teacher will arrange a time for the student to come back and see them. This may be before school, break or lunch or after school. The focus of this meeting is a positive conversation between the student and member of staff and the aim of this is about the student taking responsibility and moving forward positively. Lesson Catch up: This might happen when student has not produced enough work in the lesson or it is below expected standards. The member of staff will arrange for the student to come back after school to catch up or complete. Loss of Social time: When poor behaviour is seen at breaks, lunches, or before and after school the member of staff can choose to take away break or lunch time. Removals: There are times when the behaviour of a student falls significantly below the expectations and it is necessary to remove them from the classroom to allow learning for others to proceed. A member of SLT will review the removals each day and make an appropriate decisions regarding the consequences. Staff and students have all have a responsibility to create a school which feels calm and safe between lessons, at break and lunch times, and before and after school. By adhering to the code of conduct students are able to show they value self-discipline and integrity as well as respect for each other. It is our hope that all students will follow this code of conduct. However, students that choose not to will have their conduct card signed by a member of staff. 3 signatures or no card will result in a meeting after school with the student and their mentor. 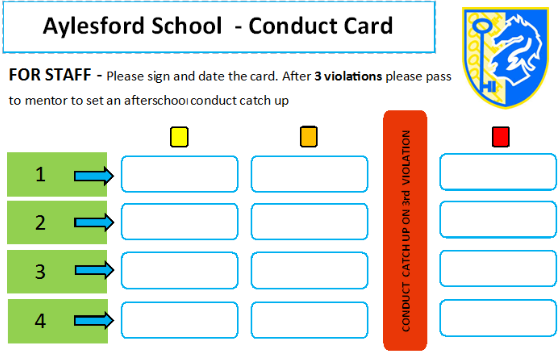 All staff can sign this card and on the 3rd occasion of this being signed the card will be referred to the students’ mentor, who will set a conduct catch up on Behaviour Watch. This will be a meeting afterschool with the mentor to discuss the code of conduct and the schools’ expectations. Mobile devices are prohibited from the moment the student enters the gates of the school. Students may have their devices in their bags or inside blazer pocket but it must be switched off. Any devices seen to be used will be confiscated and handed into reception at the earliest convenience, where it will be recorded and kept safe until the end of the day. Students are not allowed to collect their devices until after Period 5. If a mobile device is confiscated on more than one occasion the device will be kept in reception until arrangements can be made for a parent to come in and collect it on their child’s behalf. Students bring in mobile devices at their own risk and the school will not accept liability for damage, loss or theft. The Governing Body will establish, in consultation with the Head teacher, staff and parents, the policy for the promotion of good behaviour for learning and keep it under review. It will ensure that it is communicated to students and parents, is non-discriminatory and its expectations are clear. Governors will support the School in maintaining high standards of behaviour for learning. The Headteacher, Assistant Headteacher responsible for developing Character Strengths (Mr D Wright) and other members of the Senior Leadership and Middle Leadership Teams will be responsible for the implementation, review and day-to-day management of the policy and procedures. Support and training for staff faced with challenging behaviour is also an important responsibility of those in positions of leadership. All Staff will be responsible for ensuring that the policy and procedures are followed and consistently and fairly applied. Mutual support amongst all staff in the implementation of the policy is essential. Staff have a key role in advising the Leadership Team on the effectiveness of the policy and procedures. They also have responsibility, with the support of the Leadership Team, for creating a high-quality learning environment, teaching good behaviour for learning and implementing the agreed policy and procedures consistently. The Governing Body, Head teacher and staff will ensure that there is no differential application of the policy and procedures under any circumstances, particularly on the grounds of ethnic or national origin, culture, religion, gender, disability or sexuality. They will also ensure that the concerns of students are listened to and appropriately addressed. Parents and Carers will be expected to take responsibility for the Behaviour for Learning of their child, both inside and outside the School. They are all expected to have signed and agreed to the terms and conditions of the Home School Agreement. They will be encouraged to work in partnership with the School to assist the School in maintaining high standards of behaviour and uniform and will have the opportunity to raise with the School any issues arising from the operation of the policy. Students will be expected to take responsibility for their own Behaviour for Learning and will be made fully aware of the School policy, procedure and expectations. Students also have a responsibility to ensure that incidents of disruption, violence, bullying and any form of harassment are reported. If a student’s poor behaviour does not improve we will look to find alternative options to avoid a permanent exclusion. These may include our internal pupil referral unit The Bridge. If this is not successful / appropriate we will look for support from In Year Fair Access and consider the Pupil Referral Unit / ‘Manage Move’ / Monitored Transfer/Alternative Curriculum options. The Head teacher may, in certain circumstances, permanently exclude a student. A meeting of the Governors’ Discipline Committee has to be convened to ratify this decision. Once permanently excluded, the LA has a responsibility to offer educational support or to assist the parents in finding an alternative school. The parents also have a right of appeal to an independent tribunal. This tribunal’s decision is binding. Modelling of positive behaviors from all staff members, mentor group sessions, peer relationships and restorative approaches. At a curriculum level, it is evident through well-planned lessons, differentiation, preferential seating and the classroom environment. All staff are trained in de-escalation techniques and safeguarding.